Fingerprint Friday – Wildflower "Weed"
To participate in Fingerprint Friday find your own photograph that demonstrates where you see God’s fingerprint then visit the blog PamperingBeki’s Fingerprint Friday post and read the instructions. Be sure to visit all of the blogs that are participating and I’m sure they will return the favor. In early July, I planted some scraps of plantable wildflower paper in a large barrel in my container garden. It first sprouted in early August, I almost pulled it up because it looked a bit like a weed but a pretty weed. By early September it had grown to about 5 feet and was beginning to look pretty bad around the bottom. Imagine my surprise the next morning when I went out to find that “the weed” had turned into a beautiful wildflower with these gorgeous lavendar blooms and lots of little buds. Needless to say, I didn’t cut it down. I don’t know what it is but have seen them planted in the median along the highway. I am hoping that it is a perennial so that it will appear again next year. I am collecting seeds in case it’s not. If anyone can identify this most beautiful wildflower, please leave a comment or email me and let me know. I just call it the beautiful wildflower weed and a lovely Fingerprint of God! 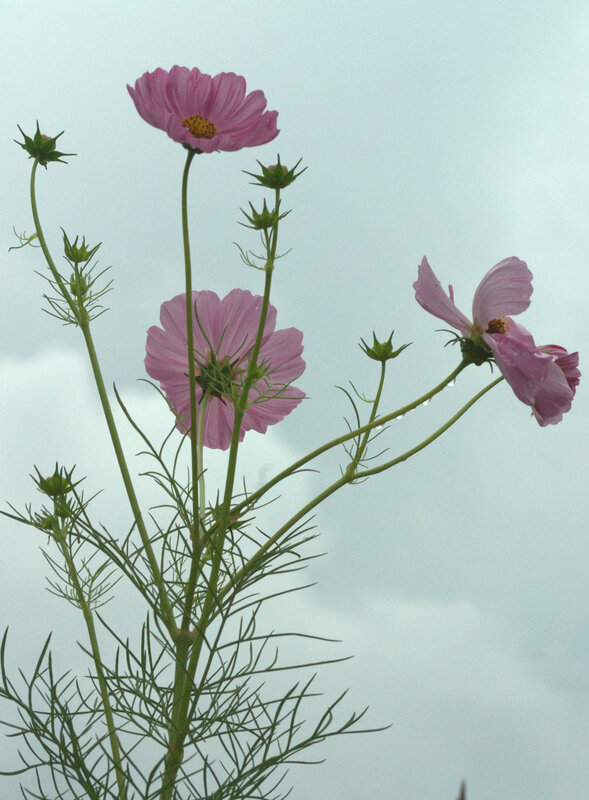 I'm thinking this may be the cosmos or poppy family, both of which, unfortunately, are annuals. But if they sprout seeds, they will grow again. Beautiful blossoms, and wonderful pictures! 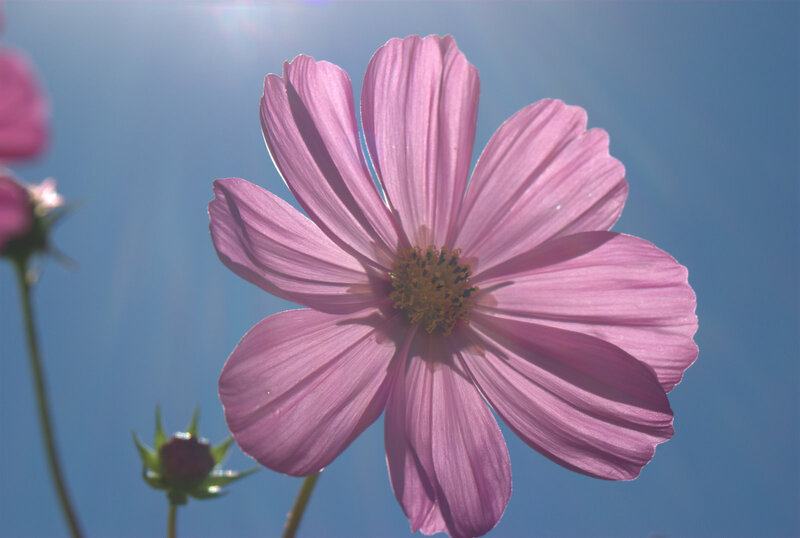 Thanks Snowcatcher…I googled Purple Cosmos and bingo…mystery solved! Thanks! What a treasure..I did think it was in the Cosmos family..the leaf was what gave me the idea. No matter what, it is beautiful and a lovely fingerprint. What a beautiful flower! I love your photos! 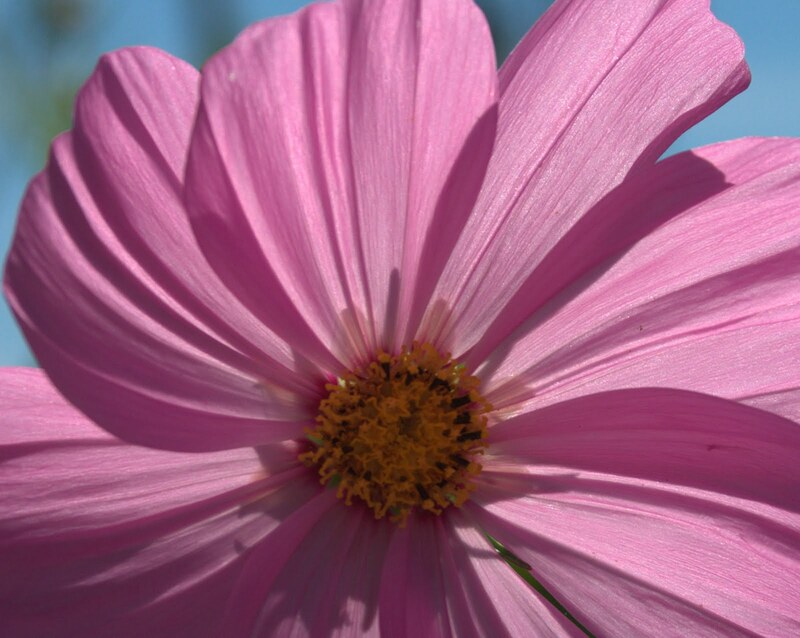 Beautiful Vicki, and I LOVE Cosmos! Have them planted all over my yard and patio! They have the most lovely foliage even without blossoms. wow they're lovely, what a great story. Thank you, Vickie, for stopping by & for your very fun comment. Glad you found that cracker recipe. I grew up in ATL, but never went to any of those clubs. Actually, I did go to a party once at the Capital City Club. Very swank! something similar happened to us. i think i get impatient sometimes. lovely post. beautiful flower! God works in mysterious ways. sometimes the greatest blessings are camouflaged in strife. it's really up to us to recognize the beauty in all things.